Cindy. I hear Christmas music. Abigail. Yes, it's Christmas Eve. Tommy. (A toy soldier doll, Entering) Merry Christmas, Miss Grace. Abigail. Merry Christmas to you, Tommy. Cindy. Miss Grace, the toy soldier talked to you. Abigail. Of course. Don't you remember Sabrina talking to you? Cindy. (Pausing) I'm not sure .... It was so long ago. Abigail. At night, when your mother tucked you in, and when you told Sabrina good night, can't you recall her saying night, night to you? Abigail. And when you took her in your arms and told her you loved her, didn't she snuggle right in, and couldn't you hear her say, "I love you, too Cindy?" Tommy. We never said it very loud, but we always said it. That's why we were your favorite toys. Dolls that don't talk to their friends never become a child's favorite toy, and spend their entire lives on shelves. Abigail. Or in glass cases. Tommy. I can’t imagine anything worse than spending my whole life in a case. Cindy. Were you a little girl's favorite toy, too? Tommy. (Indignant) Certainly not. I had a little boy named Brian O'Malley. I was a present from his mother. Abigail. Tommy’s dad was in the army and his mom wanted Brian to have a toy that reminded him of his father. Cindy. How did you get here? Tommy. Brian had taken me along to his baseball game. It was a big game. Brian's team won. When the game was over, in the excitement, he left me in the dugout. Tommy. I waited for him all night. It was the first time in years that we had not spent the night together. Abigail. But that’s not the worst of it. Tommy. In the morning a big redheaded boy with freckles found me there. He picked me up and threw me into the weeds. I never saw Brian again. I always wondered if he came back for me. If he did, he didn't find me. Abigail. I was walking my dog, and my dog found him. His foot was sticking up. Tommy. I was caught on the cane of a raspberry bush. One Christmas Eve, in a small town not far from here, there was a small shop called "The Stuffed Animal." The proprietor was a middle aged lady named Abigail Grace. Miss Grace had never had any children of her own. She lived alone with her dog, Furf. Those people that knew her well - and not many did - said she had but one abiding interest in life. Every Friday morning, no matter how inclement the weather, she could be found prowling the neighborhood garage sales. There she would search for stuffed animals and dolls --- not new ones, not beautiful ones, but shabby old teddies with their ears bitten off, and dolls who had lost their limbs. She would buy them for a dime or a quarter, and take them away. Her neighbors said she put them in her shop, but they really didn't know because her shop was never open for business. But because they saw her carry boxes and bags into the shop, and come out empty handed, that was their best guess. Especially, since she called her little shop "The Stuffed Animal." 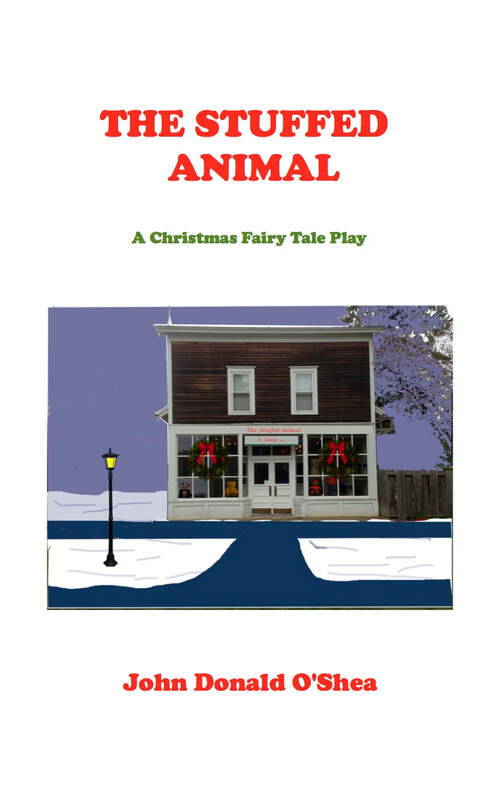 Perhaps because Miss Grace was such a private person, who always keep to herself, the people of the small Victorian town never questioned her about her activities until Cindy Kim saw Miss Grace walking Furf just after dark one Christmas Eve. Cindy, as a child had had a favorite doll, Sabrina Ballerina. Sabrina at that yard sale many years ago. the dolls and stuffed animals that were in there time, the favorite toy of a child. who one might fairly assume is an evil old which. But, "danger invites rescue," .and rescue comes in time to save Christmas. Performance Time: Approximately 30 minutes, 23 pgs.